I admire anyone who has a passion for any type of car. I may not always understand that passion, but I admire it. This guy has a passion for early 1970s Toyota Coronas. He has three of them in various states of repair and disrepair. The Corona was Toyota's family car back in the day. It was relatively roomy, somewhat well equipped, dependable and not especially exciting to drive. It had a small 4 cylinder engine and got very good gas mileage. It sold well. These Coronas are being offered as a lot. 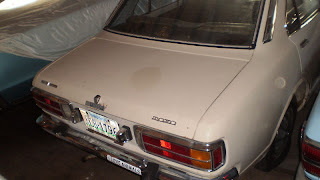 The first one is a 1971 with just 600 miles on it. According to the seller, it was involved in an accident in 1971 and never repaired. He's including a front clip (with just 3000 miles on it), which you can use to repair it. The trunk has some NOS parts in it. 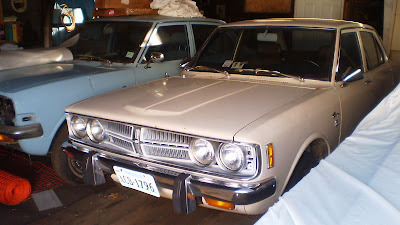 The second Corona has 40,000 miles on it and the seller mentions that it's from California, which I assume he does to indicate that it's rust free. This one is a driver and, according to the seller, "can be used anytime". The third car is from Virginia. 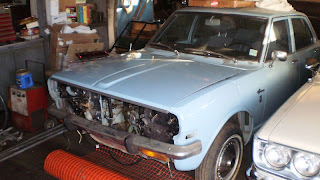 It runs and drives, but "will need some work". It has some minor rust. It too, has just 40,000 miles on it. Including the clip, these cars have a combined total of less than 84,000 miles on them. That's extremely low mileage for one 1970s car, let alone three. I would not bid on these cars. I don't find them all that appealing. But, I'm pretty certain (in fact, I'm sure, based on some of the e-mails I've gotten) that there are people who look at some of the posts I've written about cars that I want and think, "Is he crazy? Why on earth would he want to own an old ________? ". That's what makes cars so cool... We can't always explain why they're appealing, they just are. If early seventies Toyota Coronas are appealing to you, this may be your one and only chance to buy 3 low mileage, completely stock examples. Personally.. I think _some_ years of the Coronas are not bad looking at all. I usually prefer 2 door over 4 and it would be a heck of a cash of cars if they were 2 doors. All in all I could take or leave these (assuming I was in a position to add to the fleet). But, I can see a day when all the "more sane sized" classics will jump in value. Not everyone has room for a B body Dodge! Heck, a lot of places you wouldn't want to be driving something that massive anyways.